2017 was the year that Augmented Reality emerged from the trough of disillusionment. Enterprise AR, with nuts-and-bolts use cases and revenue, became the fastest-growing category within the AR/VR universe. According to ARtillry intelligence, hardware and software spending in 2017 was $3 billion, more than triple that of 2016. 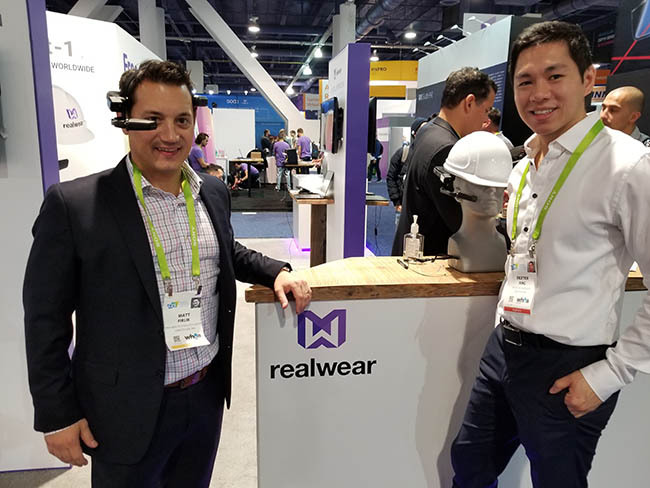 Some of the most compelling Enterprise AR products and business strategies were on display at CES 2018. The world’s largest consumer electronics convention was an excellent opportunity for companies to exhibit in the public eye. At the forefront this year was the convergence of trends enabling the next stage of AR: hardware development and miniaturization, user-centric design, and business model innovation. Enterprise AR’s primary focus is on using visual data to increase the capabilities of workers. It has been found that out of the five senses, sight constitutes 83% of information processed by the brain. The value proposition for augmenting visual information is real; workers are 30% more productive with AR-information delivered in context, according to Jim Heppelmann and Mike Campbell of PTC. Hence most applications gaining traction at the moment revolve around the delivery or production of visual information. CES 2018 also revealed some of the gaps that need to be filled for the AR movement to accelerate. First, “the world is seriously devoid of AR talent,” as Jim Heppelmann noted. Secondly, the nature of spatially-based visuals requires complex, high-resolution objects to be delivered to the user. These are generally too large and dynamic to be contained within static apps on a local client and thus need to be web streamed live. The developer community needs to establish protocols for real-time AR asset streams as it has done for web VR in the past. Wearable displays present a different paradigm for interaction and control. A killer app may be lacking the killer interaction method. Currently the most prevalent input methods are voice, swiping, and RGB and IR camera-based gesture recognition. These will leave you wanting in adverse physical environments and when performing complex tasks such as web navigation and emails. One possibility would be leveraging micro-movements as input in the same way game controllers respond to millimeter actions: small actions allow for high ergonomic efficiency and bandwidth. This type of work is being pursued by Pison and other human computer interface firms. Other firms are experimenting with multimodal combinations of brain, eye, voice, and bioactivity signals to enable context awareness. Realwear’s industrial headset has high quality voice recognition and works in environments with over 95db of noise. The headset performed well on the loud CES conference floor with no false positives, even with whispered commands. The basic list of voice commands are processed on-board for smoother operations compared to internet-enabled engines like Alexa. The HMT-1 product launched in Oct 2017 and has such rapid uptake that it will be one of the top three AR headsets in use in 2018. Over 200 customers and 75 solution partners are using HMT-1 already. Augmen.tv is the first camera-vision and AR streaming app for TV augmentation. Content is detected on the TV and synchronized at the millisecond time frame. Key to the user experience is the multitude of interactive AR content that extends and enriches the viewing experience. The comprehensive demo included characters jumping out of the scene, sports players and statistics displaying around the TV, and placing the viewer in an immersive 360 scene. The company stands to build upon a successful debut on European TV and test in the US on preprogrammed as well as live shows. The app was number one in the App Store in Germany with nearly a million downloads. Users were incredibly driven to experience the tech despite the app having a massive download size; the launch iOS version was 1.1 GB! The next generation will offload content to cloud and edge servers for lighter storage on user devices. The ability to call these assets in real-time will be a major technological innovation for the entire AR industry. The business pathway for Augmen.tv could be akin to that of Amazon Web Services (AWS). Amazon built AWS out of necessity to scale internal computing capability up and down throughout the year. The excess capacity during down times presented an opportunity to sell processing power to enterprises as a standalone offering. The challenge for a young company like Augmen.tv is to manage content creation while building first-class camera vision and asset streaming capabilities. If the company achieves the balance of being both a media and tech company, then it stands to benefit from two huge markets. Proglove is a company that surprised in both its technological simplicity and its rate of success. The entire product consists of a simple bar code scanner that is worn on the back of a partial glove with an in-palm trigger. The scanner is used mainly at car manufacturing plants and package shipping warehouses. Some use cases pair it with smart glasses for assistive reality. After just two years, Proglove is already being used in every European BMW factory. The wearable, available as a complete system for $3000, saves three seconds off every task. At car plants where each worker performs one task thousands of times a day for 300 days a year, the ROI is highly significant. The minimalist functionality of the product was the result of paying attention to customer feedback. Proglove originally sought to develop a glove with a range of features including RFID, bending sensors, motion tracking, and displays. “We found out most of the customers would be happy with a bar code scanner. That was our MVP. Simple to use. In industry, they need time to adopt. If you have something really radical, then it might kill you as a startup until you see first revenue,” explains founder Paul Gunther. It is impressive how Proglove found a way to charge a high price for ubiquitous technology. The challenge for them will be to avoid competition leading to pricing pressures. One tactic to mitigate this is to become the official supplier for clients as the company has done with BMW. Mira has developed a technologically simple yet extremely well-designed iPhone-based headset. It is highly comfortable for the user and also very socially friendly due to its transparent and open display. Others can easily see the user’s face as well as the contents being displayed. Seeing the headset in action from the outside conveys a feeling of curiosity versus enclosed VR and AR headsets. Reinforcing this feeling is the lighthearted nature of the company’s demos, which are focused on entertainment and social collaboration games. The content is app-based and allows experiences to be shared simultaneously on both the headsets and phones. The most critical aspect of Mira’s innovation may be the design of the holistic user experience. By presenting easy-to-use, full-experience tech in a non-geeky manner, Mira has created a beautiful product that could greatly accelerate the wide scale adoption of AR. It is easy to imagine the next social AR hit like Pokemon Go being played on a Mira headset. The challenge for a company with a technologically minimalist product like theirs is to build a competitive moat around the full stack ecosystem and software environment and find ways to enforce use of their headset versus the eventual knockoffs. It is important for the Enterprise AR community to recognize the collective value in developing and validating solutions for AR’s current shortcomings. In an industry experiencing triple-digit growth each year, there is impetus to join the rising tide or risk being left behind. As Jay Sumit, Deloitte Independent Vice Chairman, said, “In 2018 you will see a bifurcation of businesses that embrace AR and those that cease to exist.” The companies that actively learn from shared resources and membership organizations stand to gain the most from the AR movement. Dexter Ang is CEO of Pison, a company building the future of human computer interaction and bioelectric control. The company develops full-stack wearable technology for intuitive and powerful gesture control of augmented reality smart glasses. Pison has developed and patented electroneurography, or ENG, the first process for sensing peripheral nerve firings on the surface of the skin. Vertically-integrated solutions combine hardware, software, machine learning, and UI for AR industries. Investors and partners include Oculus, MIT, Draper, National Science Foundation, and HHS.